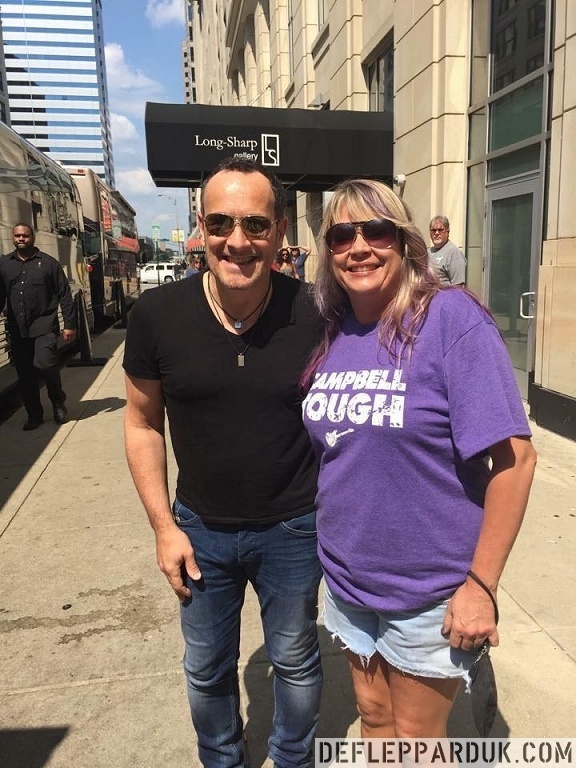 Def Leppard members Vivian Campbell and Joe Elliott met a fan wearing a Campbell Tough T-Shirt this past weekend in Indianapolis, IN. As mentioned Heather had met Joe at the Cincinnati show and he was first spotted wearing the T-Shirt designed by Jacqueline Koszuta Sandel. 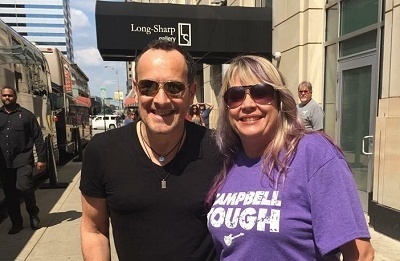 She met the band as they were leaving their hotel in down town Indianapolis before heading to the show in nearby Noblesville. As you can see Vivian was delighted to see the shirt in person and said he was "really touched" by the idea. Joe is quoted as saying they are "absolutely brilliant". Heather also met Brian Wheat from Tesla who has expressed an interest in wearing the shirt. Keep an eye out for it at future shows. Joe explained in an interview published today that Vivian's current treatments are going well. You can buy the shirt at the Artdog Designs website. Read the full story of the T-Shirt design here as told by Jacqueline herself. "Medicine may heal my body, but music and love will heal my soul." Lead guitarist of the world famous Def Leppard, Vivian Cambpell, was diagnosed with Hodgkin's Lymphoma in 2013. He has had a recent relapse, but continues his fight. 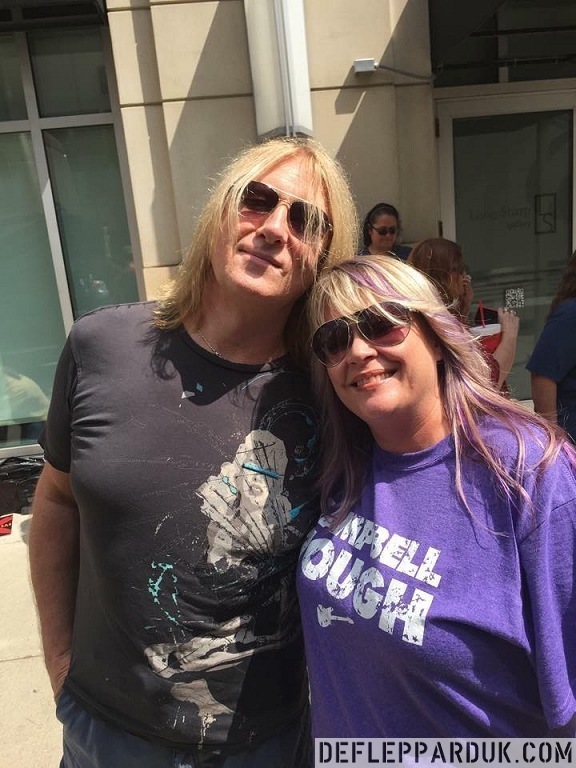 Show your support for Viv, with this original Campbell Tough t-shirt as worn by Joe Elliott! A portion of the proceeds will go to a charity of Vivian Campbell's choice! Many thanks again to Heather/Debbie.